We were worried about the cold. 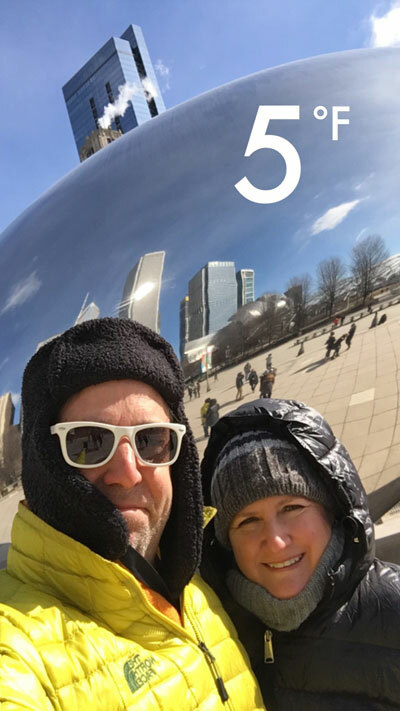 The temperature was going to be measured in single digits and, like true Southern Californians, we put on warm jackets when it dips below 65. 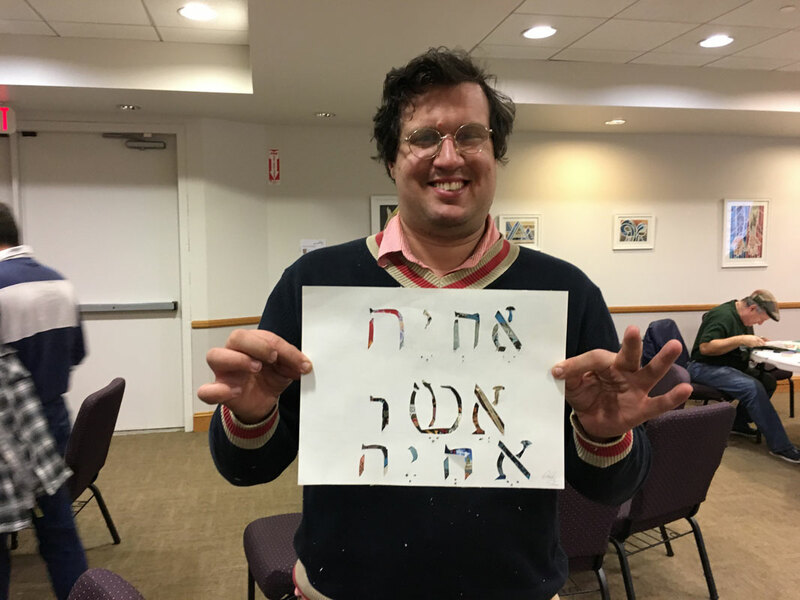 We were concerned whether people would brave sub-freezing weather to make paper midrash with us... but they did! 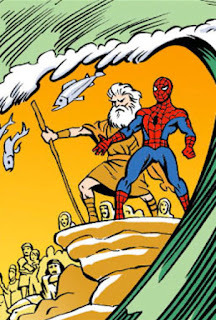 And it was great! We led two workshops at Congregation Etz Chaim in Lombard, Illinois; one for adults and one for teens. 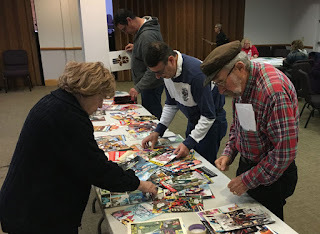 The adults came for an evening of Havdalah, a little nosh, some teaching on Midrash, and cutting up comic books. 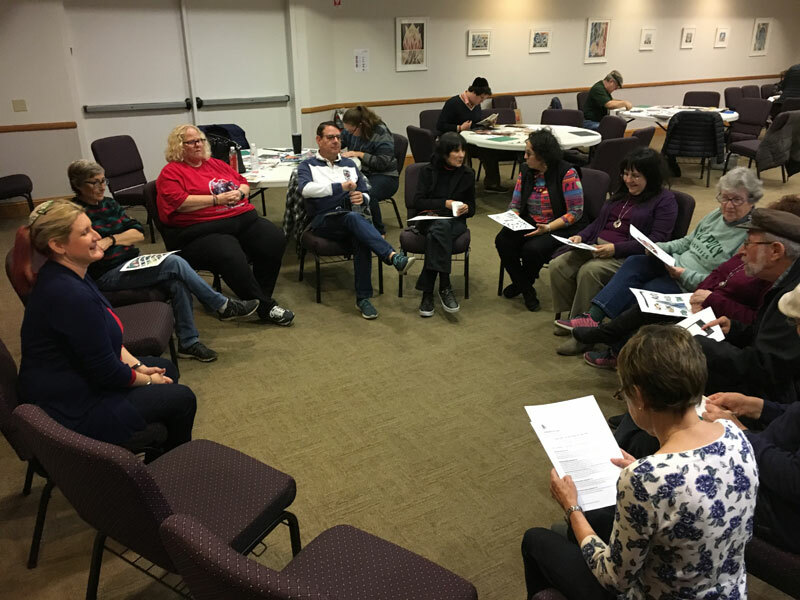 Chicagoans are not stopped by cold weather; we had a big crowd, part of the vibrant adult education program at Etz Chaim. 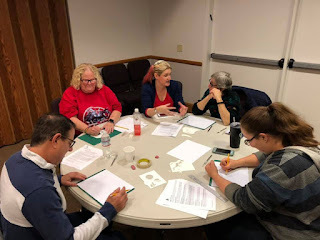 It was clear that participants were drawing on what they had studied in Melton and other programs; most participants were already familiar with what midrash is and they were ready to create their own. 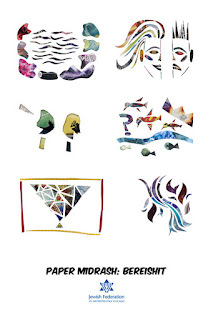 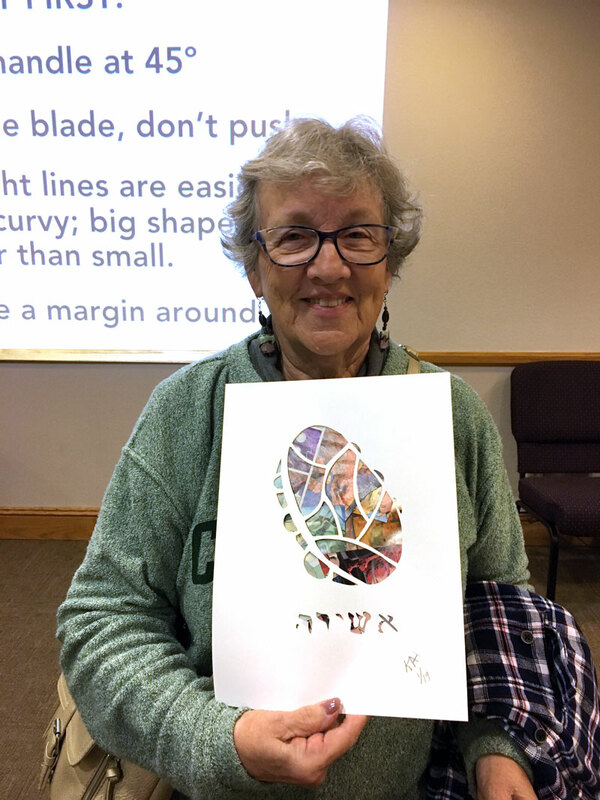 The participants made some beautiful papercut explorations of the creation story in Torah and Midrash. 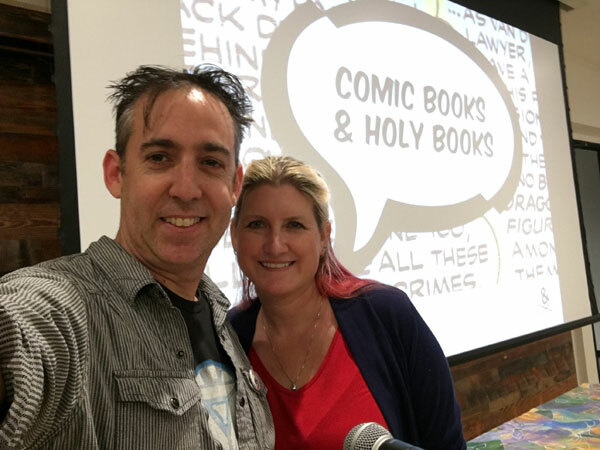 Proving that pop culture is not just for kids, one couple even stumped Isaac with their favorite villain. 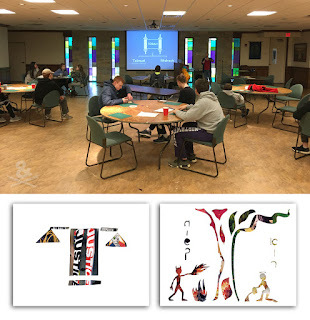 Sunday morning we worked with the CEC high school teens. 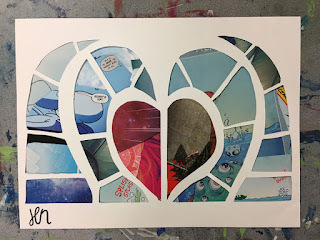 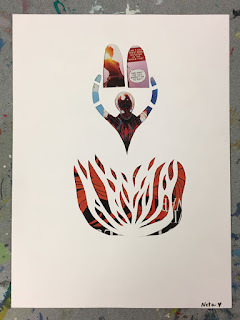 We brought lots of Spiderverse and Captain Marvel for the teens to work with and — again — we were pleased to see the depth of their designs and how even in working with the same story, no two designs were alike. 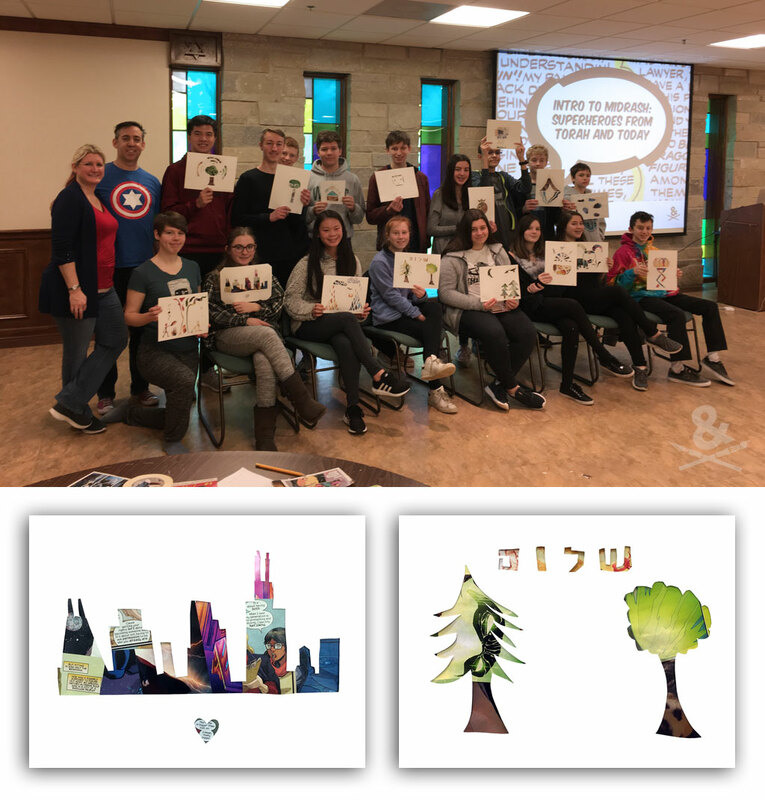 In both groups there were multiple interpretations of a midrash in Talmud that says that trees talk to each other. We wondered if it was the experience of the seasons (something we don’t have the same way in California) that had people aware of the natural cycle of spring and eagerly awaiting the the regrowth of trees. 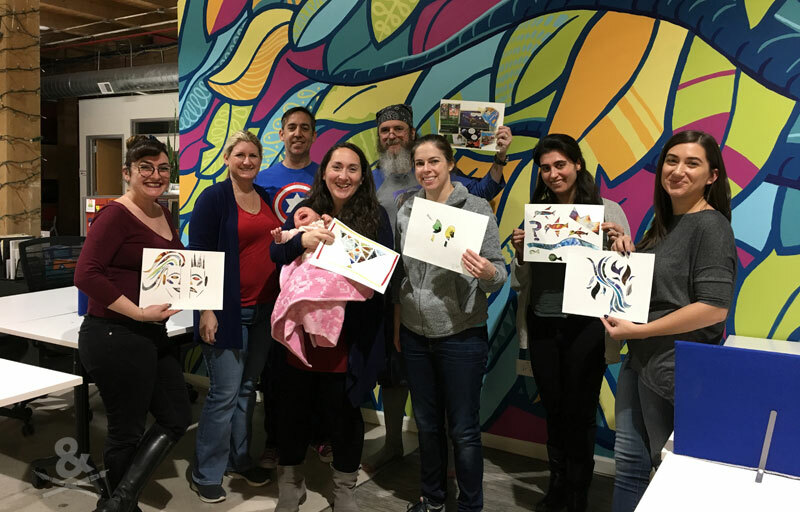 We also led a workshop for the Jewish Federation and Jewish United Fund of Greater Chicago, at a fabulous communal space in the suburbs called Sketchpad, where a bunch of Jewish organizations share space for creative (and “regular”) pursuits. We were so impressed with the concept for the space and how it was used; it was great to be able to work with talented and enthusiastic Jewish educators from different organizations, all under one roof. 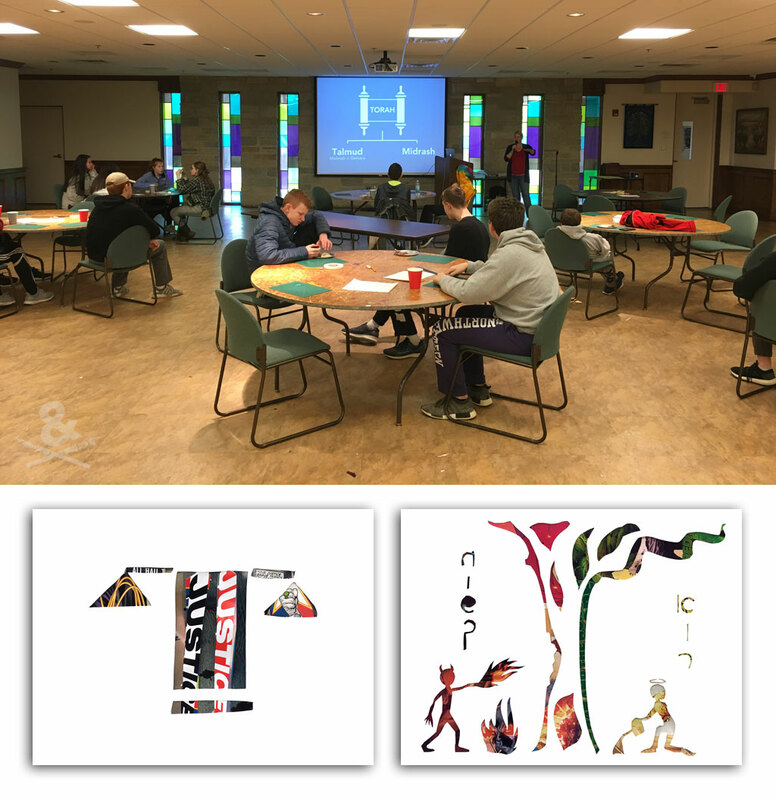 We loved learning about the space and the Jewish community in Chicago as much as we loved sharing midrash with the group. 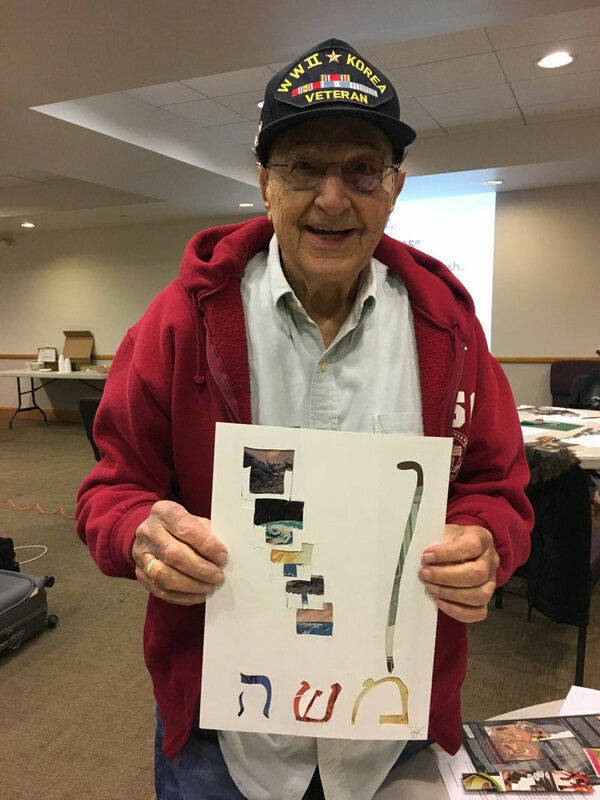 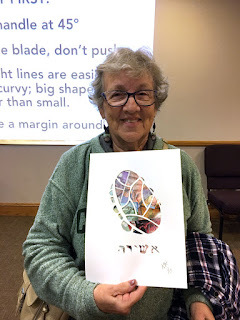 We always begin the creative part of our workshops with the blessing for creating art from On the Doorposts of Your House and were thrilled to introduce this prayer to Jewish educators, who were excited to bring it back to their own students. 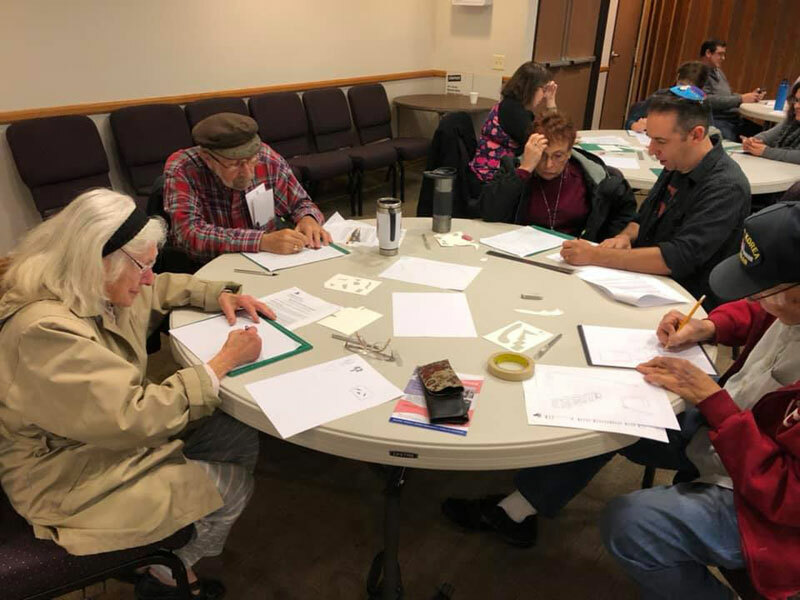 Want more information about bringing Paper Midrash to your community? 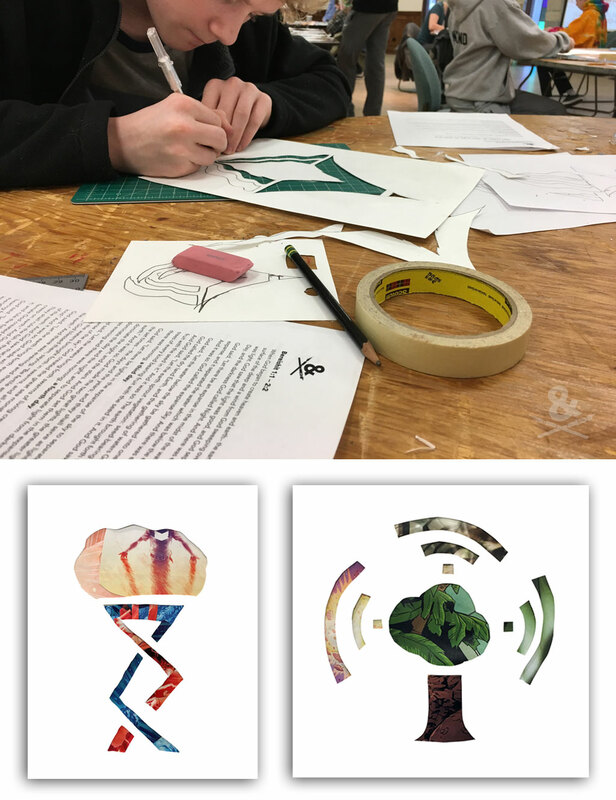 We’re currently scheduling residencies and workshops for the 2019-2020 academic year; contact us at info@papermidrash.com for details. 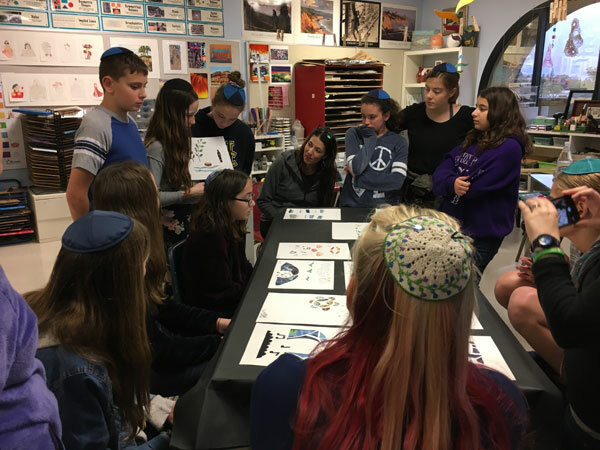 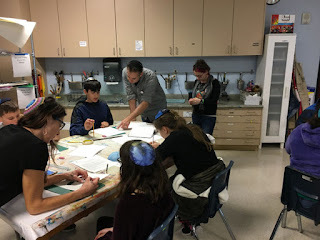 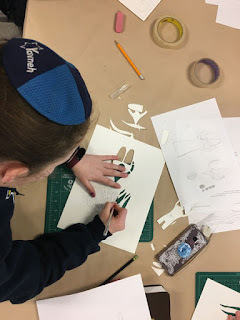 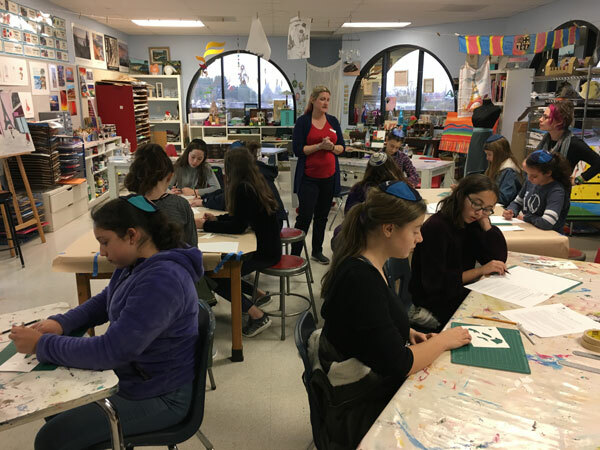 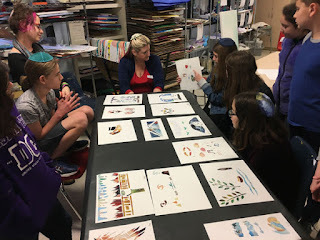 Rabbi Shawna and I had the privilege of visiting Yavneh Day School this week, where we we led a Paper Midrash workshop with their arts students and spoke at their Open House event. 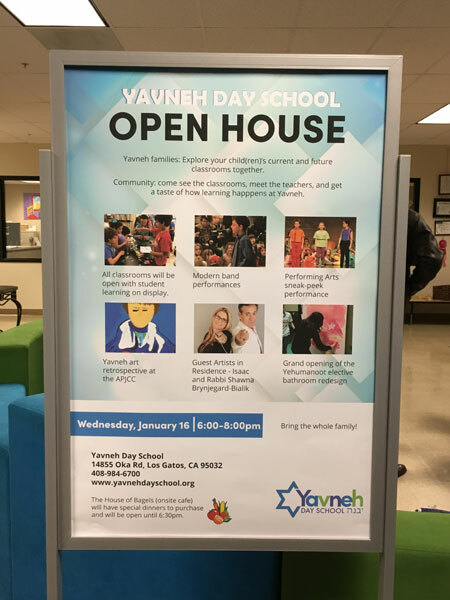 The students we worked with are fortunate to be at Yavneh, where arts and "traditional" education go hand-in-hand. 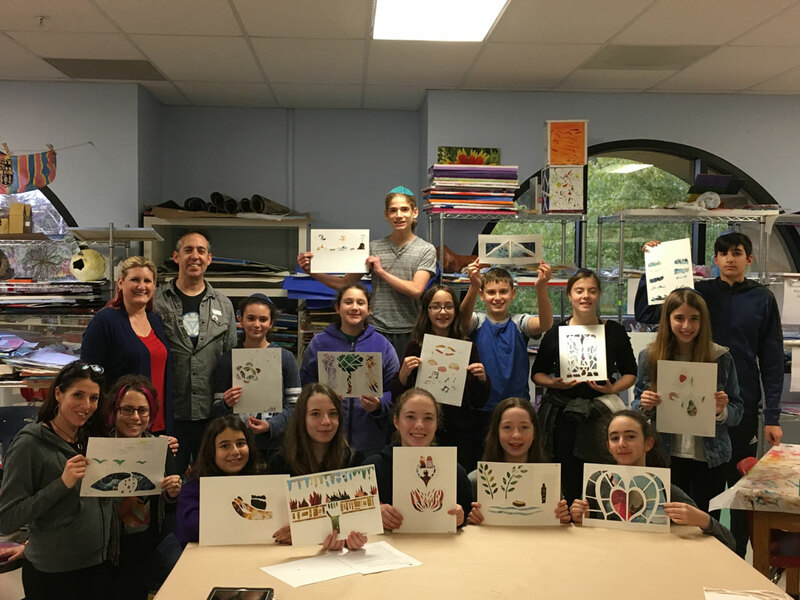 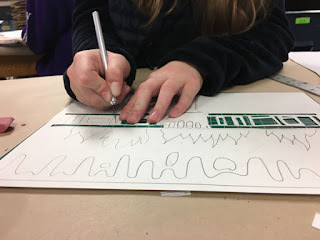 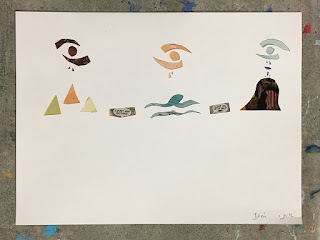 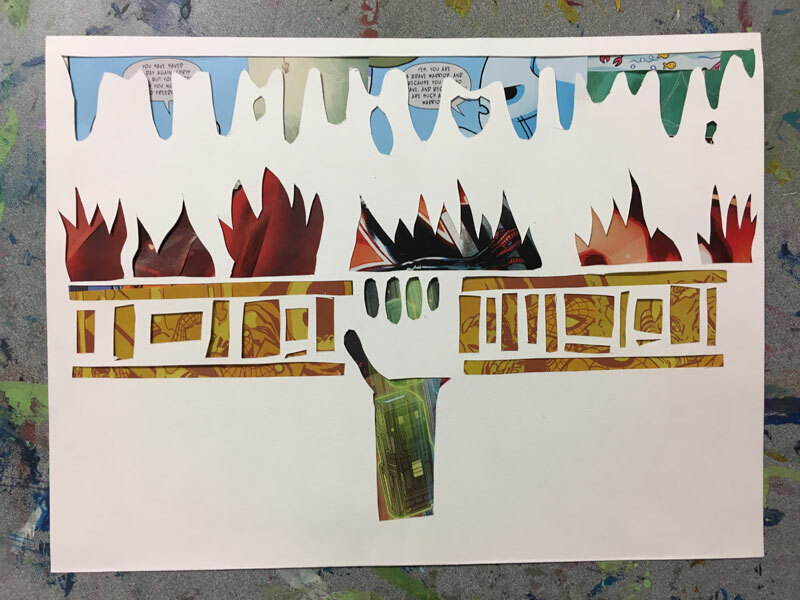 And since what we do is explore traditional Jewish texts through art, Paper Midrash was a perfect fit for their program. 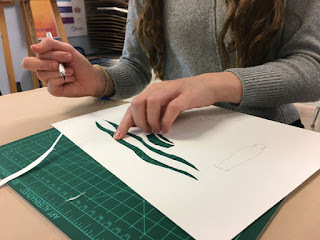 Some of the students already had experience using knives for art, and it showed in their work. 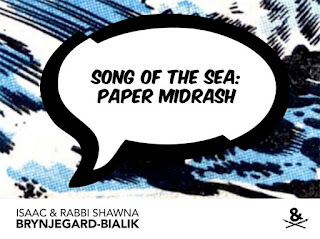 We exploring the Torah portion of the week – Beshallach – which includes the parting of the Sea of Reeds, the Pillars of Cloud and Fire, some Egypt and Moses, a little Amalek and the desert... quite a lot of text to explore with some new midrash. 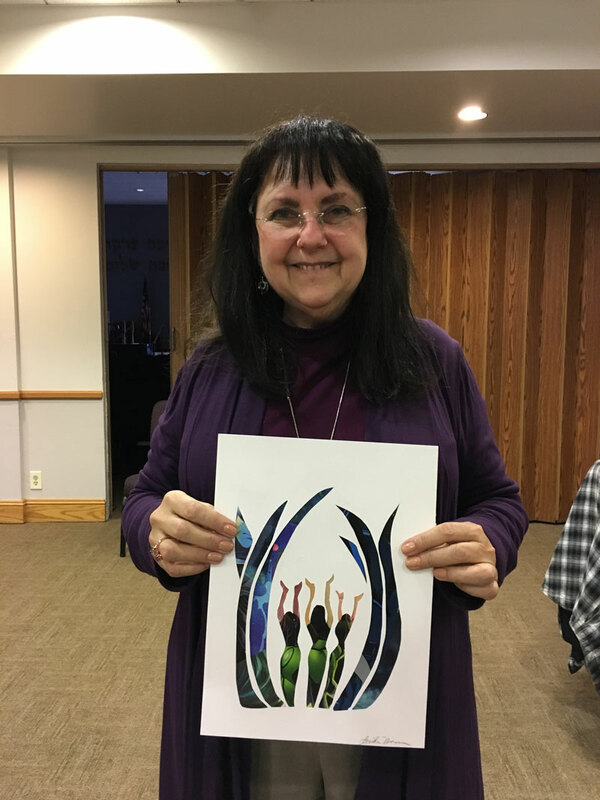 Rabbi Shawna put together a study sheet to help spark some ideas, and boy! did it ever. 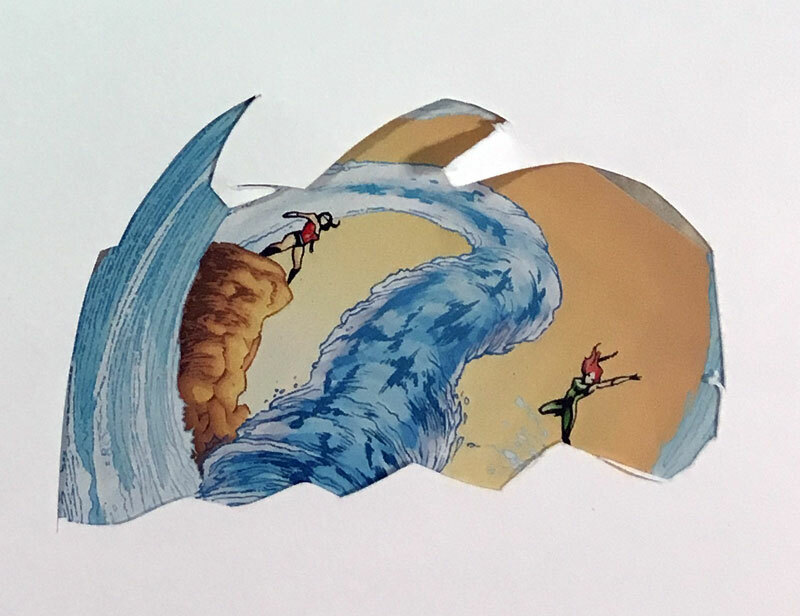 Detail featuring figures caught up in the parting sea. 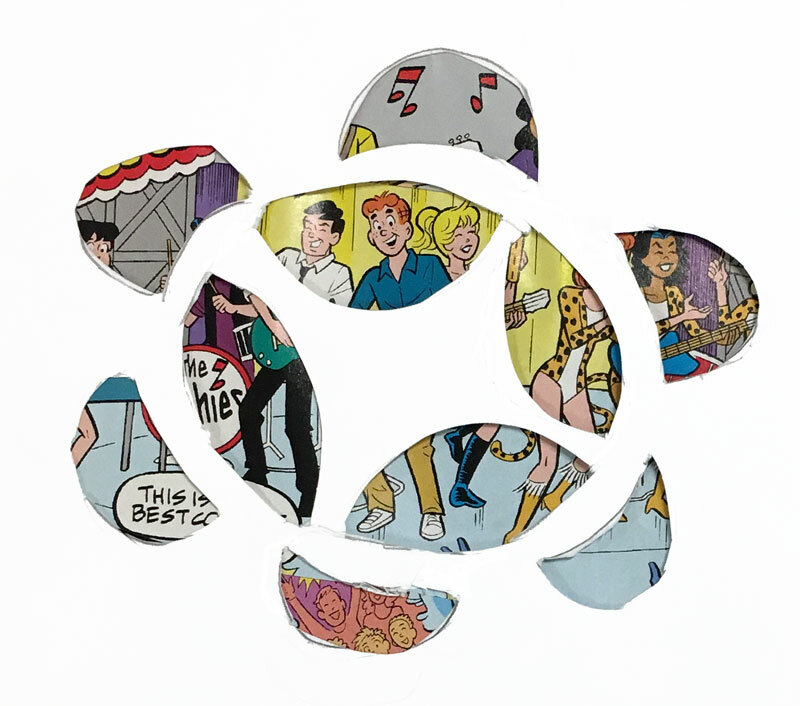 Detail of a timbrel filled with musical scenes from an Archie comic. And after they had completed their work (as usual) we had a teach-back session, where all of the students shared their midrash and taught their classmates about the midrash they explored in their art. 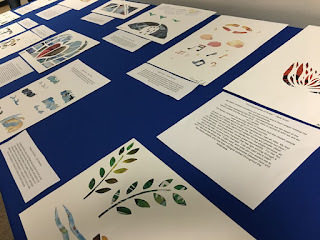 That night their work was displayed at the Open House (along with some other wonderful projects); everyone was impressed with what they'd created. 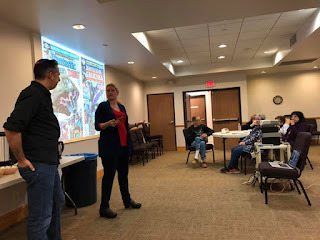 Add we were pleased to deliver a presentation on "Comic Books and Holy Books" for all of the Open House attendees. 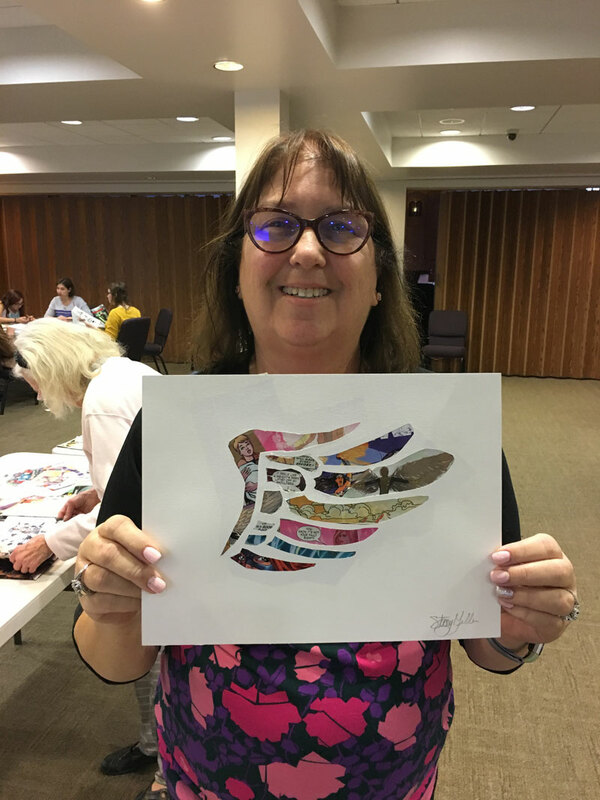 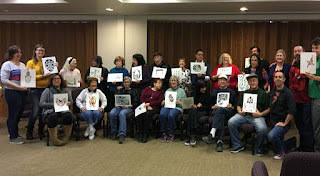 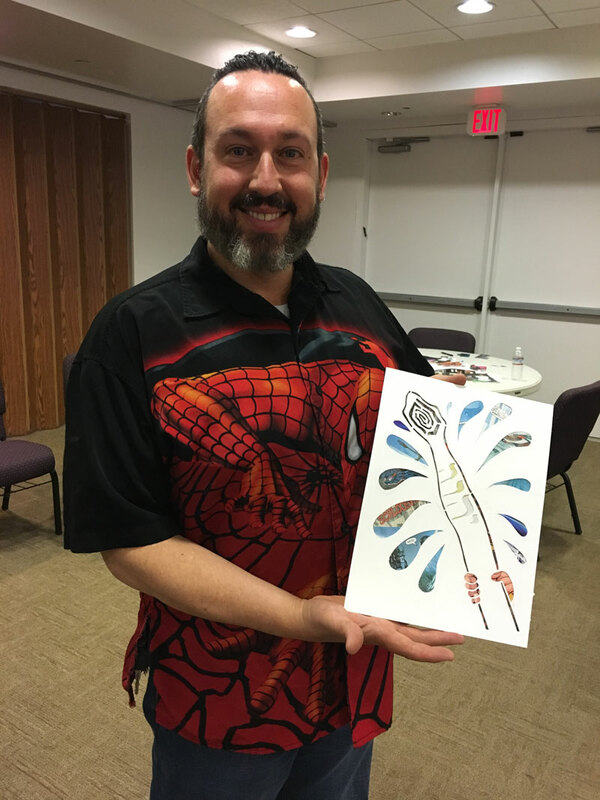 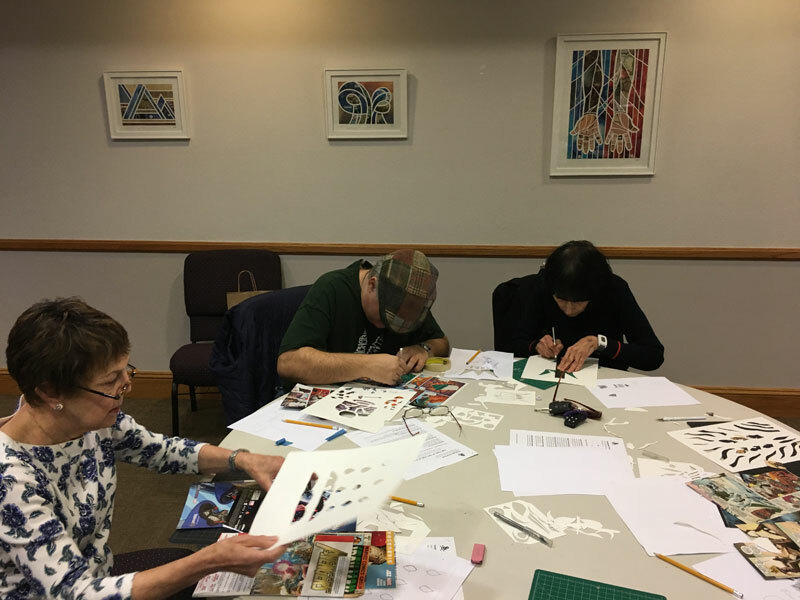 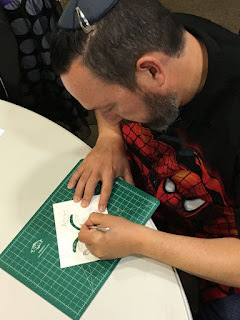 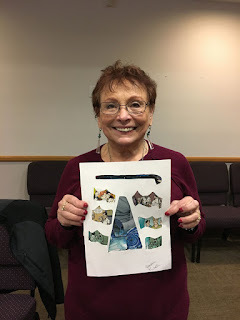 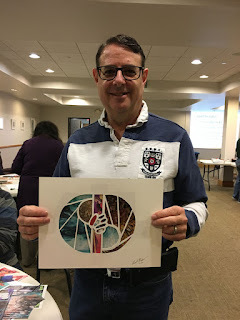 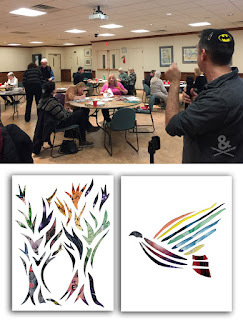 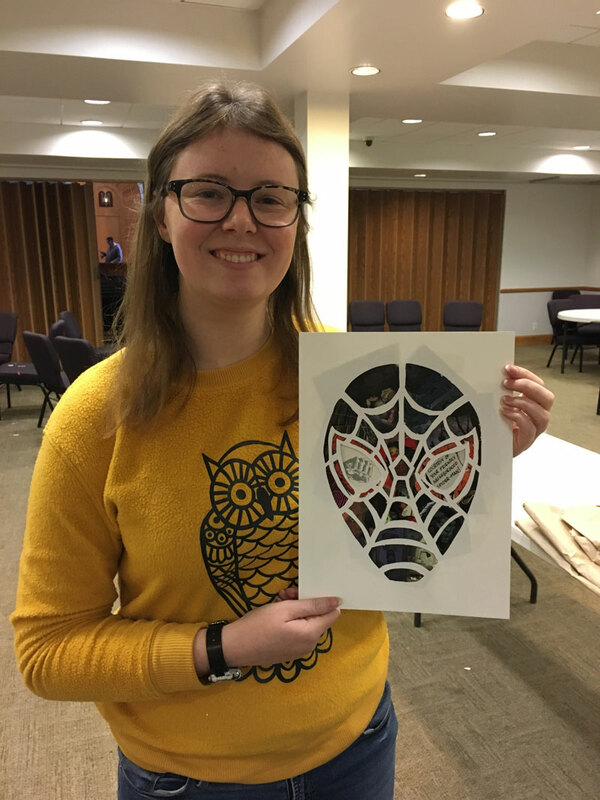 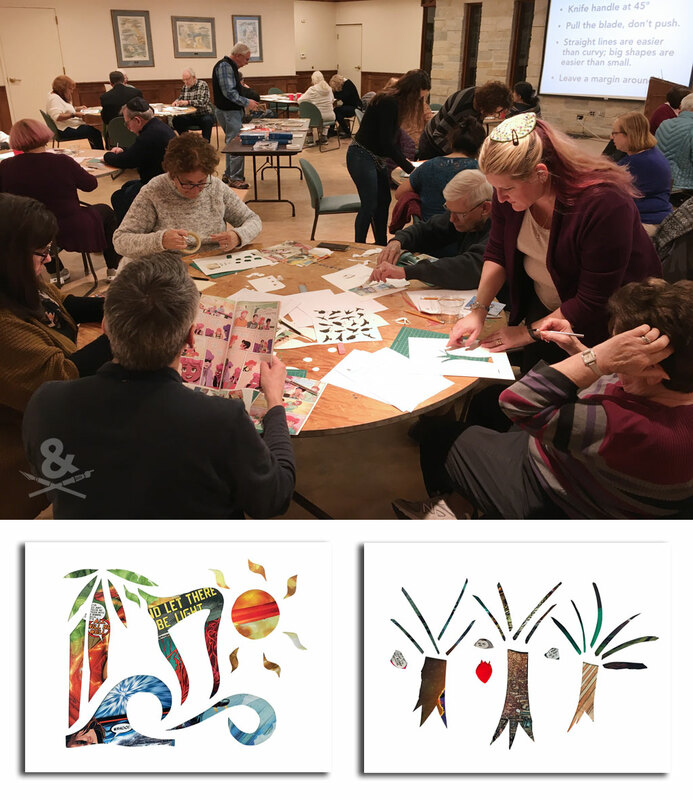 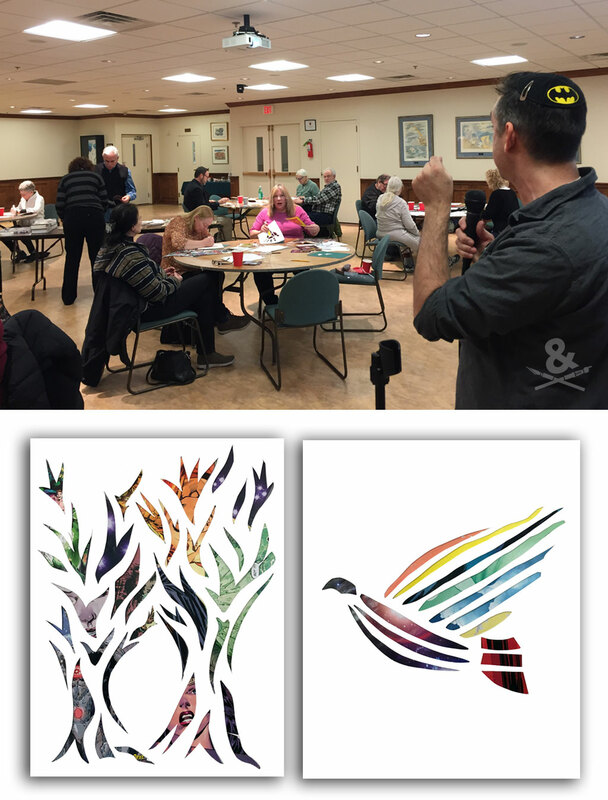 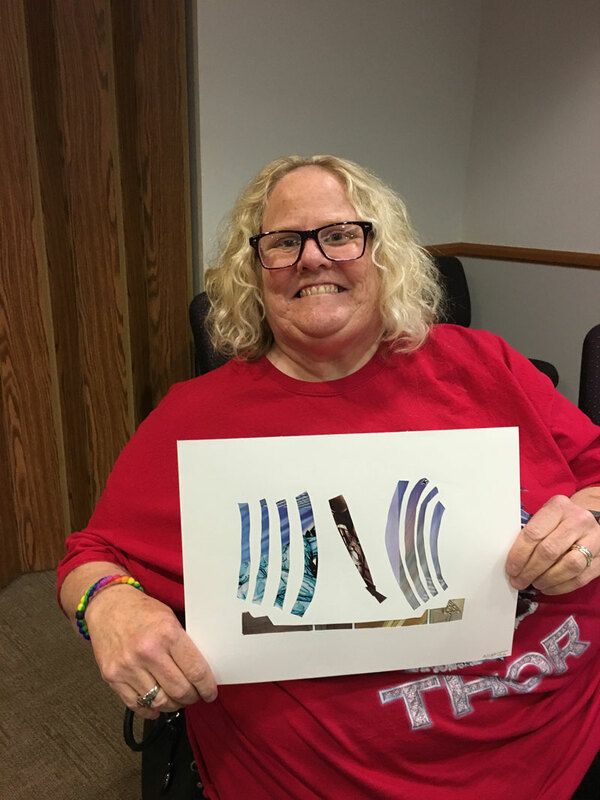 We just led another fabulous Paper Midrash papercutting workshop – this time at Congregation B'nai Tzedek in Fountain Valley, California. 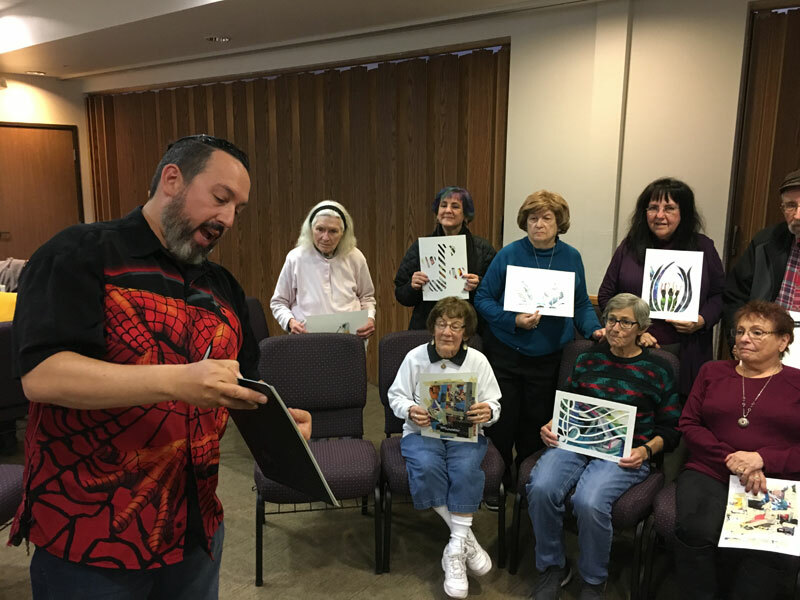 This is the kind of fun stuff you get when you bring us in to speak to your community. Rabbi Shawna and I taught a little bit about midrash, and Beshalach in particular (which includes Shirat HaYam, the Song of the Sea) – and then we gave a room full of people knives and told them to have fun (basically). Here we are, unphotogenically presenting on midrash and comic books. Rabbi Shawna teaching some workshop participants as they get started with their projects. Isaac showing some workshop participants how it's done. 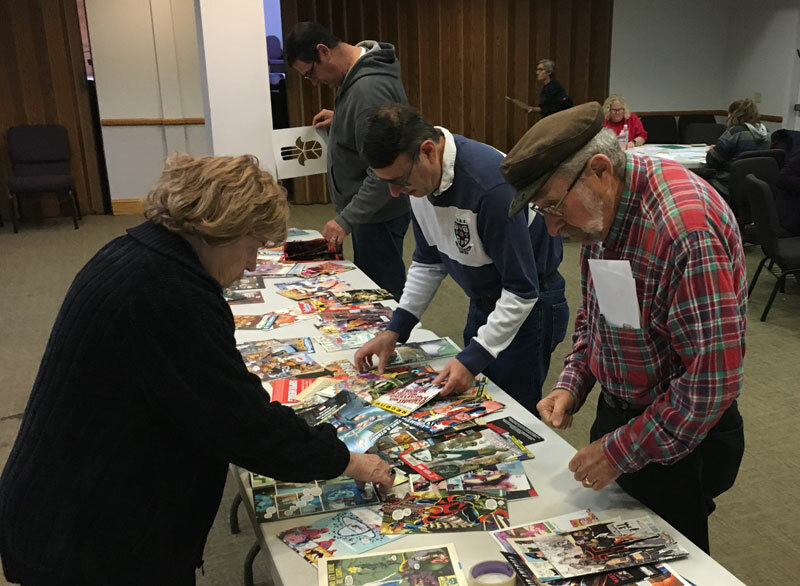 Sorting through comics, looking for just the right ones. Participants cutting paper underneath a few of Isaac's works in a "pop-up" gallery space. 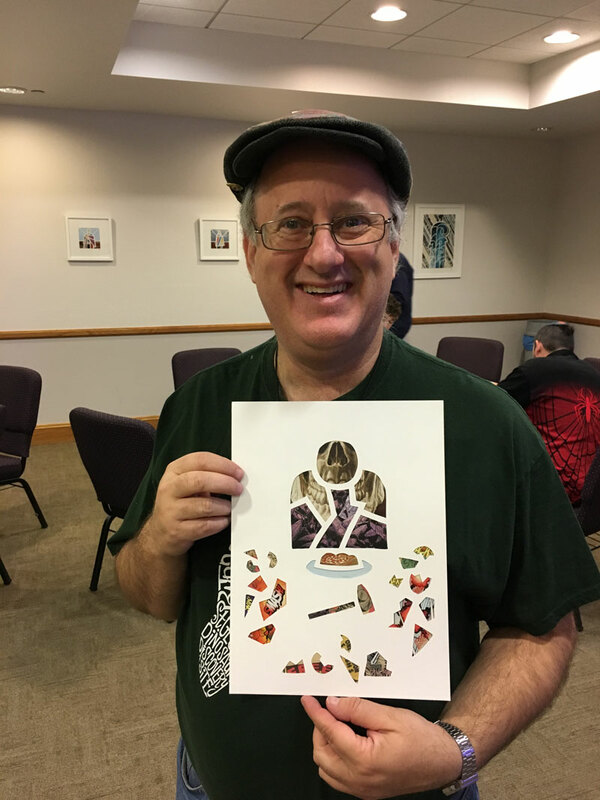 CBT's Rabbi David Young getting a handle on his knife skills. Final workshop papercut with the rod of Moses. 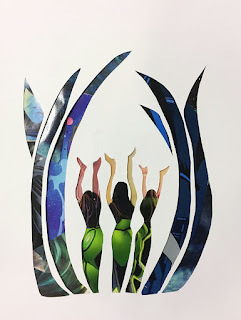 The women, singing and dancing as the sea parts. A close-up look at a final papercut. 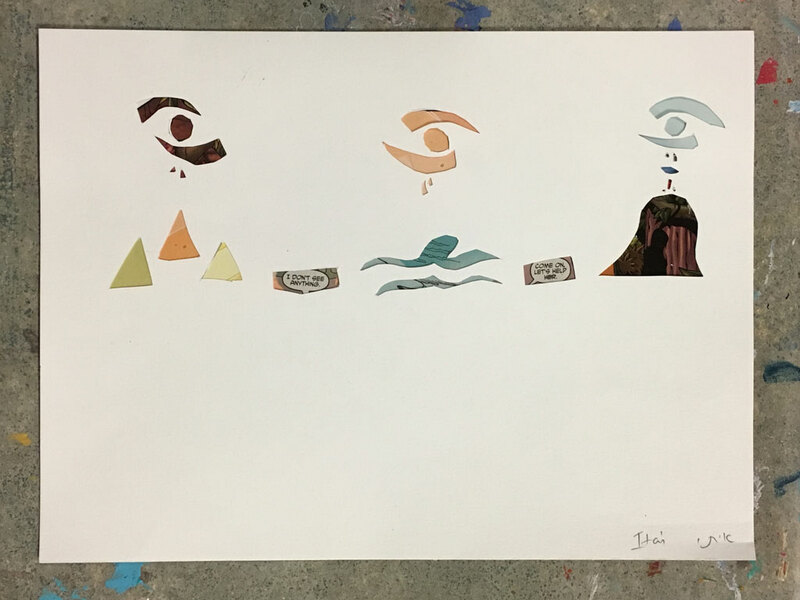 The tribes marching along in the parted waves. Final workshop papercut featuring an angel's wing. 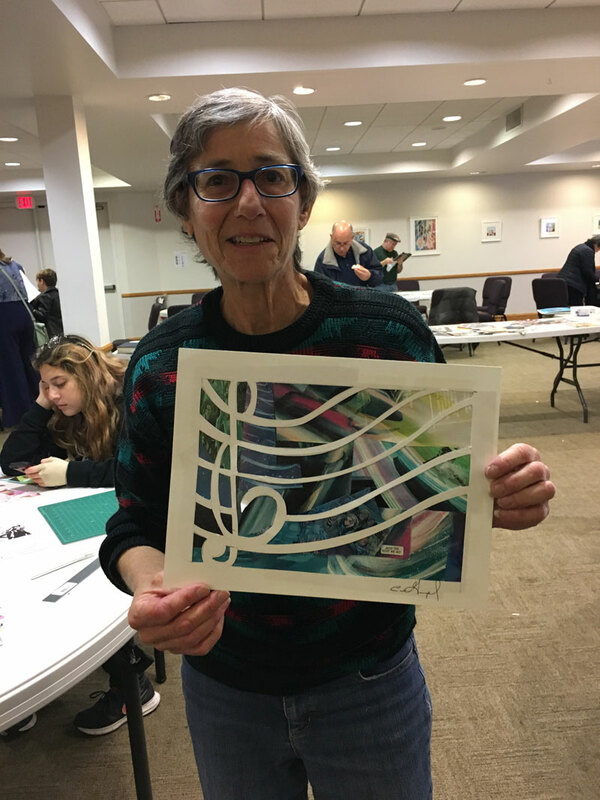 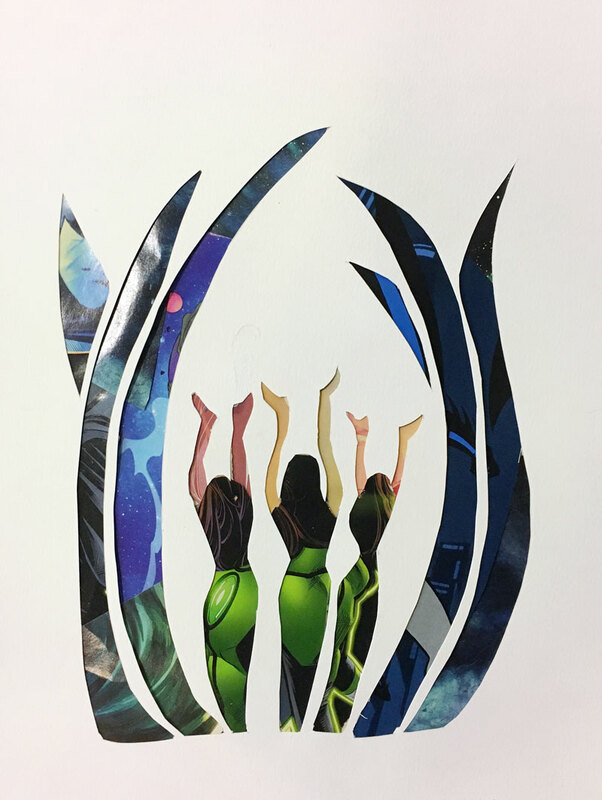 This papercut features a sequence of the waves parting, and "Moshe" in Hebrew. 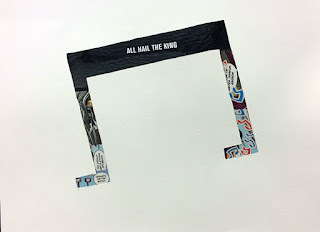 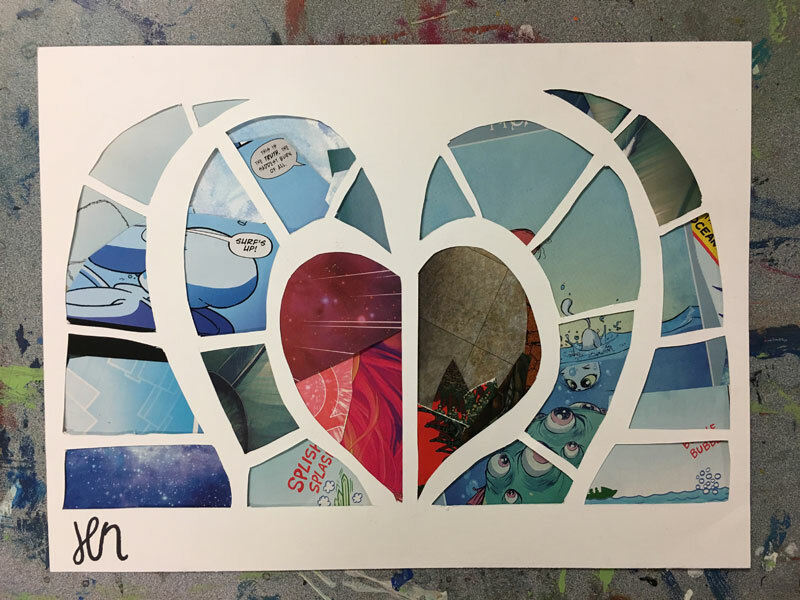 Final workshop papercut, with a musical theme. Close-up look at this musical paper midrash. 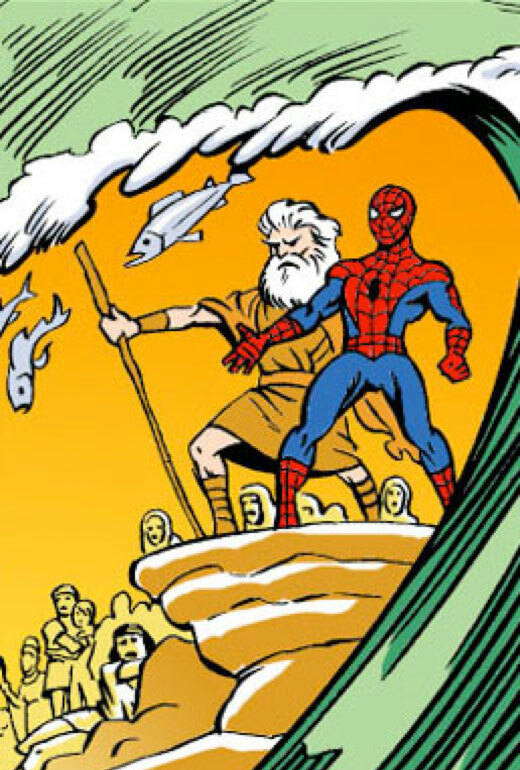 The Sea of Reeds, parted by the rod of Moses. 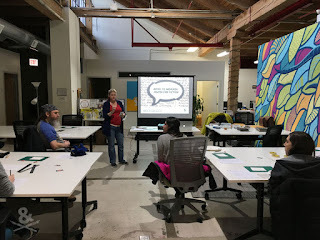 We end all of our workshops with a "teach-back session." Another musical midrash inspired by Beshallach. 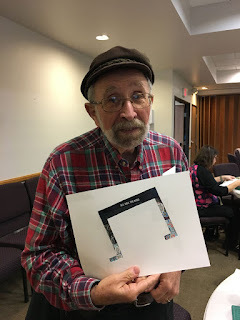 Rabbi David Young sharing his final papercut with the group. 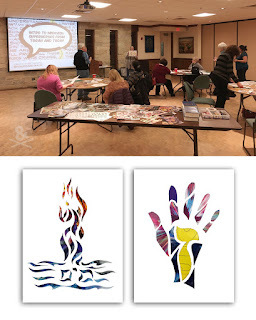 Sometimes workshop participants explore other themes – in this case, Abraham breaking the idols. Rabbi David Young's final paper midrash, with the rod of Moses emblazoned with the name of God. The whole CBT workshop group with their final papercuts.